Welcome to the Syncrolight ShowBuilder, an online service that allows you to quickly and easily generate ready to use lightshow sequences that are tailored to your exact layout. The ShowBuilder works with small to medium sized displays. So if you have just a few lights, or a garden full of lights, the ShowBuilder will create a sequence that will use all your items in time with the music. These following sections contain all the information you need to understand and use our ShowBuilder service effectively. To access the ShowBuilder, install Syncrolight Version 2.5 (or later) and open the Show Designer. Then simply click on "Tools" and you should see the ShowBuilder listed in the drop down menu. 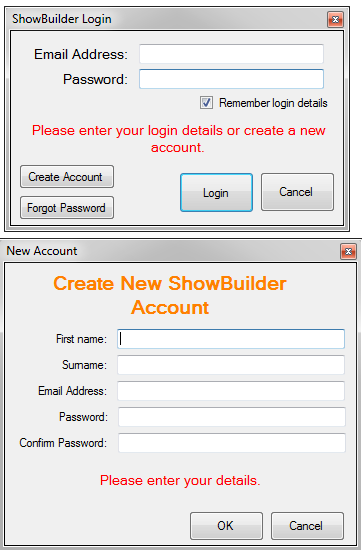 To login to the ShowBuilder you will need to create an account. This is a simple process, click "Create Account" from the ShowBuilder login screen and enter your name, email and password for your account. We'll then send you an email to validate your account. Account registration shouldn't take longer than five minutes. Only name and email address required (for contact purposes). Grants access to use ShowBuilder features. Keeps track of your uploaded layout version. Keeps track of what shows you have purchased. 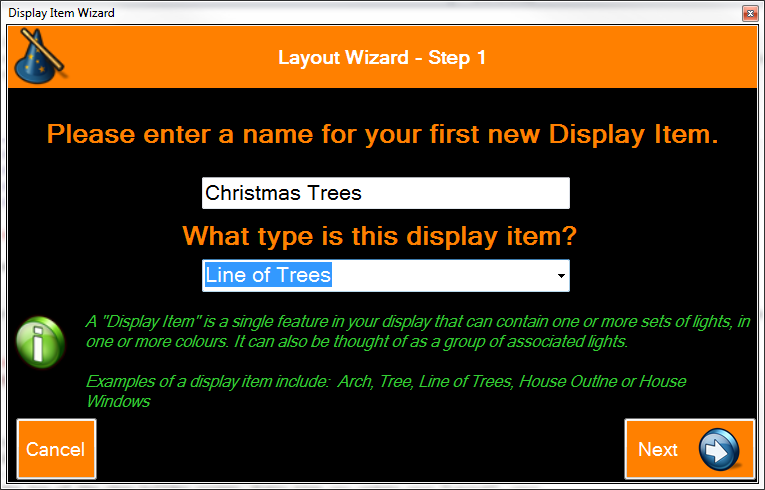 Once you have created an account and logged in, the first thing you need to do is define your "Layout" so that the ShowBuilder knows what items you have in your display. To define your layout you can either use our Layout Wizard or extract your layout from an existing show. It’s important that you know what items you have in your display and respective colours as the ShowBuilder will need to know this in order to take advantage of these during the show. Before uploading your layout, take a moment to notice the “Upload Version” at the top of the ShowBuilder screen. Every time you update your “Layout”, your upload version number will increase to reflect that. Note that you only need to upload your layout once, unless you have made changes to your display that you want the ShowBuilder to use. It is important to understand that you cannot use your own music with the ShowBuilder. The songs listed in the ShowBuilder are the only ones that will work. If you wish to use your own music for a lightshow you will have to program the sequence yourself with the Show Designer. Note also that if you use a different version or a cover of the same song, it's likely that it won’t synchronise correctly to the lights. To avoid this we recommend you use the links provided in the ShowBuilder to purchase the music track that the show is designed for. MUSIC tracks are NOT included in the show and must be purchased separately from a music reseller (links are provided). If you already own the music check it’s the same version as the one we have linked to avoid synchronisation errors. We have a selection of shows available in the ShowBuilder some are FREE and some you can purchase. Additional tracks will be added to the library from time to time, and these will automatically appear in your ShowBuilder screen. When first using the ShowBuilder we suggest you try the free shows initially so that you can get your layout correct and try different layout ideas. If you want to purchase a show click on the “Buy Show” button and you will see your selected show added into your basket within the ShowBuilder screen. On the website you will be directed to the payment process where you can pay either by card or through PayPal. Once this process is complete you should refresh the ShowBuilder and a button should appear called “Build”. The build process is quick and usually only takes a minute or two but it can take longer sometimes if validation or verification is required. Once the build is complete the “Download” button will appear when the screen if refreshed or opened. Once it has been downloaded, a button called “Open Show” will appear, clicking this will automatically open the show you just built and load it into the Show Designer. Once you have opened the show in the Show Designer you will need to specify the location of the associated music track which you have purchased and downloaded separately. To associate the music select the "Show Properties" from the file menu. You will get some time to make adjustments after building, but these "rebuilds" are limited. You should only "build" a show if you have made changes to your layout that you wish to see in a new version of your show. Build times for shows are generally very short. Sometimes shows will require validation and/or verification. You can purchase shows below or through the ShowBuilder itself. If purchasing a shows below, please ensure you use the same email address for the checkout and for your ShowBuilder user account. The Syncrolight Software package (Version 2.5 or later) must be installed to access your purchased ShowBuilder sequences. The MUSIC is NOT included in the sequence and must be purchased separately from a music reseller (links are provided). A SyncroLight Standard or Professional licence may also be required to use or modify the built ShowBuilder Sequences. The ShowBuilder is designed for small to medium displays. The ShowBuilder is not currently suitable for use with RGB lights or Pixels. Please see the Syncrolight Software package for full terms and conditions of use for the ShowBuilder sequences.